Science is increasingly researching alternative healing approaches, including that of meditation. Previous studies have shown that meditation has positive effects on everything from blood pressure to immune function. A new study points to improvements in not only stress but also attention capacity. The study was spearheaded by Yi-Yuan Tang of Dalian University in Northeast China and Psychologist Michael Posner of University of Oregon. The team gather a random sampling of eighty students who were required to practice 20 minuets of Yoga a day. The practice involved either body muscle group relaxation techniques or integrated body-mind training. 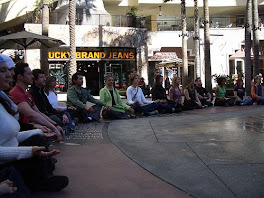 After five days the group who meditated scored higher on tests involving both attention and mood states. The group additionally showed lower levels of stress hormone cortisone when asked to perform complicated math equations (meaning function better under pressure). Although the study showed promising results, the real curiosity is the long term effects of short term meditation, and long term effects on ongoing meditation. Roger Walsh, a psychiatrist who studies meditation at the University of California, Irvine summed his view up quite simply..."The real goodies come with long term practice." It seems that perhaps well being, just might be a few short Om's away.